Rob Hart will discuss and demonstrate examples of projects pursued by students and colleagues in the courses, “How to make (almost) anything” and “Unseen Harvard: Elements of Ambience” and will describe the less formal learning that is going on in the Science Center fabrication shops. 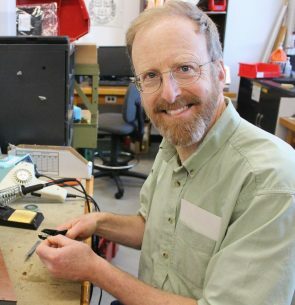 Robert Hart is member of the Physics Instructional Lab team in the physics department. He has been making things for many decades in order to pursue teaching, research and personal expression. In recent years, he and his colleagues have introduced new digital fabrication capabilities to the Science Center shops, and have worked to increase access to these resources. Rob is especially delighted to be able to work with artists, designers and teachers to help them incorporate modern methods of making into their work and lives.